The Mayor's Breakfast - A Success With an Electric Flavour! 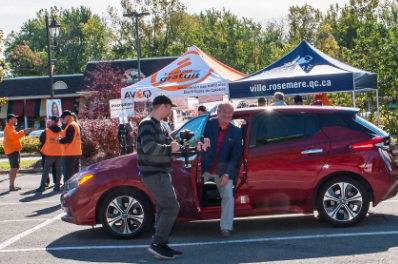 ROSEMÈRE, September 25, 2018 – On September 22, many residents gathered in the parking lot of the H.-J.-Hemens public library to meet with specialists from the Association des véhicules électriques du Québec (AVEQ). For the occasion, various models of electric cars were on display. In fact, more than 50 participants took advantage of the event to conduct road tests. Many also had the opportunity to attend a talk entitled "The electric car, is it for you?" and to discuss with electric bicycle conversion specialists. "The Mayor's monthly breakfasts are informal opportunities for residents to interact with elected officials on issues that affect them and concern them. Preservation of the environment is an often discussed issue to which the Town attaches great importance! We hope this initiative gave residents a chance to learn more about this subject and will encourage them to make the use of electric vehicles a priority. We wish to thank all the participants!" stated Rosemère Mayor Eric Westram.